No one had ever underestimated the power of broadcast advertising. 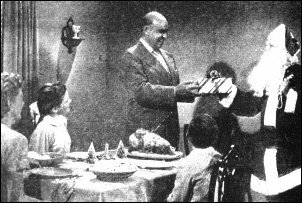 Less than fifteen months before the first television commercial appeared on British screens, on July 4th 1954, the Minister of Fuel and Power, Geoffrey Lloyd, burned a large replica of a ration book at an open meeting in his constituency to herald the official end of fourteen years of rationing in Britain. The dawning of a new age of prosperity was upon the British public. From a retailers point of view the start of commercial television could not have been better timed. 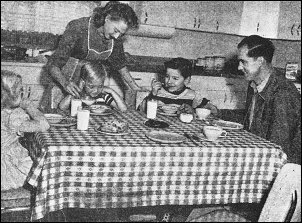 Although the first rationing restrictions had been lifted three years after World War II had ended, starting with flour on 25th July 1948, followed by clothes on 15th March 1949 and canned and dried fruit, chocolate biscuits, treacle, syrup, jellies and mincemeat on 19th May 1950, the process of lifting consumer restrictions was a slow one. 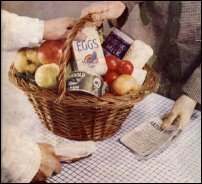 But with full government backing the British consumer was now being openly encouraged to help a vigorous post-war recovery that would restore consumption to pre-war levels. Feeding this growth was a marked increase in investment and productivity against a background of low unemployment, which fell as low as 1.1%. Inflation too was relatively low. And although there were steep rises in prices in 1951 and 1952 as a consequence of the Korean War, between 1953 and 1960 the average annual rate of inflation was just under four per cent. The fact that the average growth in wages exceeded that in prices translated into an increase in consumers' disposable income and this was increasingly directed towards the purchase of goods that had hitherto been beyond the reach of many. The most spectacular growth was in sales of consumer durables from fridges to washing machines, from cookers to steam irons and from vacuum cleaners to televisions, all of which would rise by 70 per cent by the start of the next decade. In spite of objections to advertising on television by some MP's (see THE ITV STORY PART 1) it was a willing British Government that gave the go ahead for commercial television in the UK which was seen as yet another way to encourage consumer confidence in a growing economy. No one had ever underestimated the power of broadcast advertising. As early as 1920 the Daily Mail began the bandwagon rolling by sponsoring the first ever entertainment broadcast advertised to the British public from the Marconi works in Chelmsford. In 1922 the newly formed British Broadcasting Company found itself in financial difficulty and were forced to run 'sponsored' broadcast concerts. The News Of The World, the Daily Herald and Titbits were among those willing to pay for the privilege of having their names mentioned on Britain's first official radio station. This lasted until 1927 when the company's private shareholders were bought out by the British government and renamed the British Broadcasting Corporation. And in the 1950s Radio Luxembourg, an important forerunner of pirate radio and modern commercial radio in Europe offered a cheap and effective way to advertise products to audiences in the UK by circumventing the broadcasting restrictions in place at the time. In 1954 one 75-word advertisement drew 229,000 replies. It seems that with the impending start of commercial television in Britain everyone was attempting to attract advertisers, fearful of losing major revenue to the opposition. 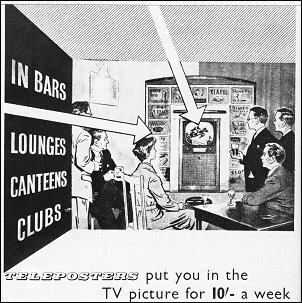 The cinema, another leading advertising medium, conducted a 1954 survey that revealed 3 weekly visits to 'the pictures' was not uncommon among the British with men more likely to visit than women, and the working class more likely to go than the middle class. The British Transport Commission were not slow in cashing in and went all out to attract advertisers to its sites at underground stations and on buses. They too conducted their own survey and discovered in 1954 that 71% of women passengers travelled on the lower deck of Central London buses and 6.2% of men on the upper deck. In both cases product placement was tailored to suit these findings. Newspapers and magazines proved profitable for advertisers prior to commercial TV and in January 1954 Vogue magazine were 'forced' to announce in trade magazines that all its advertising space was filled until March (or was this simply a publicity stunt?). 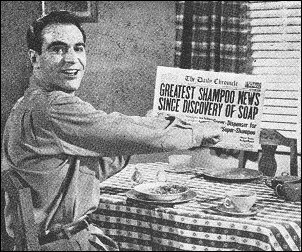 If nothing else, 1954 must have proved a lucrative year for advertising analysts. Even the BBC was accused by an unnamed member of the Cheam Chamber of Commerce of jumping on the bandwagon in February 1954. He condemned the BBC's practise of taking cameras into leading London stores and drew attention to a particular instance when a sales assistant showed a sale item marked down from 75/- to 17/6d and told the reporter this was a "genuine reduction." The Cheam member claimed it had been easy to identify the store on the TV screen and he would consider sending the BBC "a strongly worded protest." A director of Presbury's Screen Advertising Association, told his clients that they should avoid the use of regional accents when advertising - even in the regions! With the bandwagon picking up speed as September 22nd approached it was now time for the major advertising agencies to 'advise' their clients on the most effective way of selling their product to the British public. Guy Presbury, a director of Presbury's Screen Advertising Association, told his clients that they should avoid the use of regional accents when advertising - even in the regions! Today of course it is generally accepted in advertising that regional accents can work much better, in many cases inferring qualities like thrift or common sense. Voice can convey social background, gender and approximate age, all of which can be used to match target audiences. DO keep demonstrations simple and believable Be honest in the actual demonstration, without camera tricks or exaggerated results. Work in closeups when possible so that the viewer learns by example how to use the product. DO cast for believability. 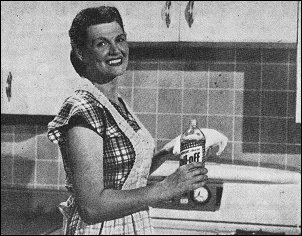 Often it is wise to use older housewives in "example" selling. Authority begins at 40. 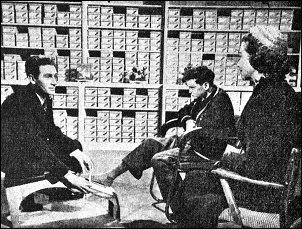 A scene from a film ("The Story of Johnny Blair") made for television transmission to advertise shoes by C. & J. Clarke Ltd. Live action is considered most suitable for such "serious" products and a "must" for products where quality counts. DON'T make wild claims you cannot prove. TV exaggerates the exaggerated claim-more than any other medium-and makes it ridiculous. DO expect to repeat a singing jingle in any films, especially in cartoons. 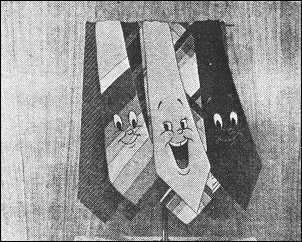 This tie spot ran intermittently in the US for four years. 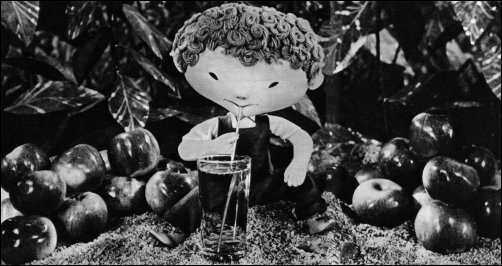 Viewers do not quickly tire of music and animation, except in saturation campaigns, where repeated too often, too soon. DON'T try to extract comedy from established traditional concepts. Never risk being offensive with things"sacred" to viewers. DO use familiar settings. This breakfast table and kitchen are within the desire-believability of the average viewer. DON'T use settings beyond the experience of the viewer. In TV, the mind does not have time to orient itself to the unusual setting, then grasp the message. 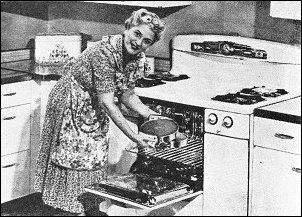 This scene was intended to show the housewife playing bridge within the time she saved by using the washing machine. 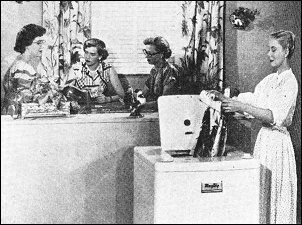 By Thursday evening on 22nd September 1955 an estimated 658,000 viewers (watching on 188,000 televisions) tuned in to watch the first night of commercial television in the UK (although the audience were mainly in the London area). When Jack Jackson announced the first 'natural break' it signalled the start of advertising on television-and here began the first lesson: During the live boxing match from Shoreditch a 'natural break' was taken between two rounds. The last advertisement before cutting back to the match was for Watney's Beer. The advert showed a row of beer tumblers emptying themselves unaided while the voiceover told viewers, "You try it." At this point the picture cut back to the boxing just as one of the fighters was spitting frenziedly into a bucket. One can only imagine the horror on the face of Watney's executives as they viewed their first TV commercial. Mistakes aside, that first night raised £24,000 in revenue of which 12,000 guineas (a guinea being £1 1 shilling for those too young to remember) was handed over to charities nominated by the Lord Mayor of London. However, this did little to appease those still dissatisfied with the whole concept of TV advertising and they made their feelings quite well known. 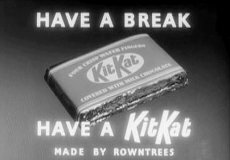 One of the first things they attacked was the ambiguity of the term 'natural break' and many wanted the rules defined more clearly. Although the ITA had laid down the ground rules at the outset (see THE ITV STORY PART 2) it wasn't long before certain MP's were asking questions in the House of Commons. The first two 'official' questions were put to Postmaster-General, Dr Charles Hill, in December 1955. Patrick Gordon Walker, Labour MP for Smethwick, asked what action was to be taken about the extension of 'natural breaks' in programmes, such as had occurred during a boxing match on November 15th, when an advert had interrupted the boxing. Elaine Burton, Labour MP for Coventry South asked why "the insertion of an advertisement for Esso petrol had suddenly appeared in the middle of Sportsview on the night of November 16th?" These were merely the first two 'official' complaints about the standard of TV advertising that seemed to be raised almost weekly in Parliament right through to the early 1960s. Although some of these complaints may seem trivial now, the TV companies themselves took them quite seriously. In February 1957 and in December 1958 complaints were lodged against a Granada TV programme called Under Fire, a political discussion show along the lines of Question Time when firstly the respected journalist Kingsley Martin was halted in mid-sentence for a commercial for Tide washing powder, and secondly Mr Gerald Gardiner QC was also interrupted whilst making his point during a heated debate on capital punishment. Both breaches in the guidelines to 'natural breaks' were reported to the House of Commons with a request for disciplinary action to prosecute the ITA. Granada TV reacted first and announced that in future Under Fire would be broadcast without any interruption from commercial breaks. Although the television companies seemed very successful in heading off any official complaints, in July 1959, Don Chapman, Labour MP for Birmingham Northfield, set the wheels in motion for the first significant change in the way goods were advertised. Chapman had received a letter from a Mrs P Cole who outlined three instances in which the claims of some advertisers were misleading. The first of these were for Hovis, which was advertised as having eight times more wheatgerm than ordinary brown bread. The advert claimed that based on this fact Hovis was then eight times better than any other brown bread. The ITA investigated and found that the claim could not be substantiated and as such it had to be withdrawn. 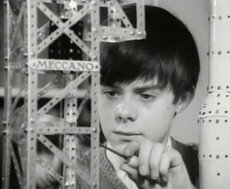 Even so, it wasn't until 1964, when the Independent Television Companies Association set up a committee to vet commercial scripts before they went out to programme companies that the claims of advertisers came under any rigorous control. However, there was more controversy to come, and it would threaten the very existence of ITV. Laurence Marcus October 2005. Reference Sources: TV Mirror magazine (various), The Guiness Book of TV Facts and Feats, The Television Annual (various editions), Girl Television and Film Annual (various editions), ATV Television Show Book (various editions), The Tuppenny Punch and Judy Show by Jo Gable, Yesterday's Britain (a Reader's Digest publication). Advertisers buy advertising time on the screen, ranging from fifteen seconds to one minute. They buy this time from the contactors, who finance the programmes out of the revenue so gained from advertisers. In any one hour of programmes there will be not more than six minutes of advertising. For much of the time it is expected that advertising will be shown only at the start and finish of half-hour programmes. Under the Act empowering the ITA to set up commercial television in Britain, it is intended that advertisers should have no say in the content of the programmes shown between advertisements. News programmes will have no association with advertising. The ITA expects its contactors to work to a code of standards regarding good taste and propriety in advertising. The second year is almost certain to provide its real test, commercially. For the first time proof will become apparent whether this new medium pays the advertisers who invest in it. Should there be too great or too protracted a financial loss, the ITA will have to agree to change its ethical principles, so that advertisers can hit the consumer harder and guide him or her more forcibly to the shop counters.